Our journey toward understanding the nature of our universe began thousands of years ago and had its roots in religion and philosophy. Around 2,300 years ago, careful observers in the Mediterranean deduced that the Earth must be round and must orbit the sun. With no way for these early theories to be proved correct, however, they could not stand against the more flattering notion that the Earth was at the center of everything and that the cosmos existed to support human life and destiny. It took quite a bit more than seven days to create the universe as we know it today. SPACE.com looks at the mysteries of the heavens in our eight-part series: The History & Future of the Cosmos. This is Part 4 in that series. Our current understanding of the history of the universe is visualized above, with time running from left to right. We think that immediately after its creation at the time of the Big Bang, the universe expanded dramatically – an event called inflation. Our first stop is the planet we call home. The knowledge that the Earth is shaped like a ball is actually quite old. About 2,500 years ago, Greek travelers reported that different constellations were visible in the sky when one went far to the north or south. Keen observers also would have noticed that during an eclipse of the moon, the shadow cast by the Earth has a round edge. A few centuries later, the scholar Eratosthenes estimated the size of the Earth by noting the difference between the lengths of shadows cast by the sun in locations a few hundred miles apart. Now we pull back to see the Earth in the context of the inner solar system. Early ideas about the movements of the sun, Earth and planets were derived from theological, astrological and philosophical notions of how God must have ordered the world. Polish astronomer Nicolaus Copernicus caused an uproar in the mid-1500s by suggesting the Earth moved around the sun and not, as leaders of Christianity taught, the sun around the Earth. For centuries the planets were thought to move because they were embedded in nested "crystal spheres" that rotated around a central point. However, it was noted in the 16th century that comets moved in such a way that would crash them through those crystal spheres. Replacing the spheres was the idea of "epicycles," circles superimposed on circles, mathematically influencing each other to result in the observed planetary motions. 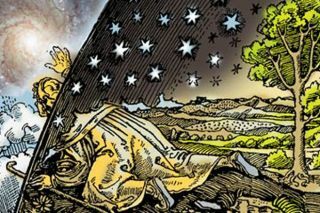 From the earliest eras of human pre-history, the entire universe was thought to encompass only the elements visible to the naked eye: Earth, its moon and sun, five points of light that moved and were called "planets," plus a distant sphere upon which the stars and the glowing band of the Milky Way were embedded. Theories of astrology and, later, astronomy were devised to explain the movements of these celestial objects, but their true nature could only be guessed at. When in 1609 the Italian astronomer Galileo finally trained a crude telescope on the heavens, he discovered that the planets were other worlds. Several of these worlds were found to have moons of their own. In the 17th century, the invention of the telescope by Galileo and the discovery of the laws of motion by Kepler prompted the realization that stars were just like the sun, all obeying the same laws of physics. In the 19th century, spectroscopy — the study of the wavelengths of light that are emitted by objects — made it possible to investigate the gases that stars are made of. Scientists also figured out in the 19th century how to measure the distances to stars. When an object is viewed from different vantage points, the object appears to shift relative to the more distant background. The shift is called "parallax." As the Earth orbits the sun, it provides a changing vantage point for observing the stars. Since the stars are so much more distant than objects in our own solar system, the parallax shift is very small and hard to measure. The layout of our galaxy is difficult to figure out from our vantage point, which is embedded in it. By studying the shapes of distant galaxies and carefully measuring the objects that we see in our own galaxy, we have inferred that ours is a barred-spiral galaxy. A central bar-shaped core composed of stars (and harboring an extremely large black hole) is surrounded by spiraling arms, also formed of stars as well as gas and dust. We are located in a spur, or branch, that stretches between major spiral arms. The exact configuration of spiral arms is still debated by astronomers, but a recent survey found that our Milky Way galaxy has two major arms, which branch out into four arms toward the outside. The spiral arms of our galaxy are thought to be a kind of density wave that travels around the flat disk. Material bunches up, and stars are formed along the arms. Everything in the galaxy orbits around its center, and the arms are not solid structures. Our solar system travels into and out of the spiral arms as it orbits. While studying the rotation of galaxies, it was noted that they do not rotate as we would expect them to based on the gravitational pull of the matter we can see. Swiss astronomer Fritz Zwicky suggested in 1934 that there must be a large amount of invisible, or "dark," matter present, making spiral galaxies more massive than they appear. The Milky Way, a faint ribbon of light that spans the sky, has been known throughout history. Its true nature was not discovered until the 17th century, when Galileo Galilei studied the Milky Way with a telescope and determined that the ribbon was composed of a multitude of stars. Small fuzzy patches of light can be seen in the sky; these were called nebulae. By the 18th century it was speculated that the Milky Way was a huge system of stars bound together by gravity, but the nature of the nebulae remained unknown. They could have been small clouds of gas within the Milky Way, or perhaps they were external to our galaxy. It could not be proved whether or not the Milky Way constituted the entire universe. It was first noticed in the latter half of the 19th century that there is a large group of nebulas in the constellation Virgo. Later it was discovered that these nebulae are separate galaxies external to our Milky Way. One hundred years later, astronomers speculated that the apparent alignment of these galaxies might indicate a higher level of cosmic structure, variously dubbed a "metagalaxy" or "supercluster." In 1982 astronomer R. Brent Tully published an analysis of the distances to the supercluster member galaxies, showing that they were indeed part of a larger organization. The largest structures that we know of are the galactic filaments – also called supercluster complexes – that surround vast voids in space. The galaxies in a filament are bound together by gravity. When the first of these structures was discovered by Margaret Geller and John Huchra in 1989, it was dubbed "the Great Wall." A much larger structure, the "Sloan Great Wall," was discovered in 2003 by J. Richard Gott III and Mario Jurić. The observable universe is everything that we can detect. It is a sphere 93 billion light-years in diameter, centered on Earth. We cannot perceive the entire universe at once, due to the slowness of the speed of light compared with the vast scale of the universe. As we look out into space, we see objects as they were at earlier and earlier times in history. Also, because of the accelerating expansion of the universe, distant objects are much farther away than their age would have us think. For example, the edge of the observable universe is estimated to be about 46 billion light-years away, even though the universe itself is only 13.7 billion years old. The true extent of the universe is unknown. It could be much bigger than the observable universe – perhaps even infinite in size. However, light from the most-distant regions would never be able to reach us; the space it must pass through is simply expanding too fast.